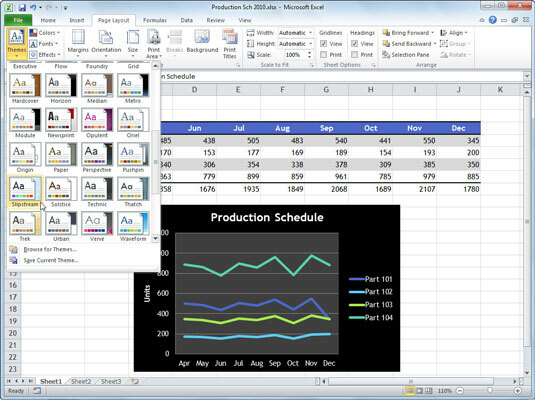 With themes, Excel 2010 provides a way to uniformly format all the text and graphics in a worksheet. You can do this by simply clicking the thumbnail of the new theme you want to use in the Themes drop-down gallery, which you open by clicking the Themes button on the Page Layout tab of the Ribbon. Use Live Preview to see how the text and graphics you’ve added to your worksheet appear in the new theme before you click its thumbnail. Just hover the mouse pointer over a theme in the drop-down gallery to see what it will look like. The Themes gallery with Live Preview showing the highlighted theme in the worksheet. Colors: To select a different color scheme, click its thumbnail on the Colors drop-down palette. To create your own color scheme, click the Create New Theme Colors option at the bottom of this palette to open the Create New Theme Colors dialog box. Here, you can customize each element of the color scheme and save it with a new descriptive name. Fonts: To select a new font, click its thumbnail on the fonts drop-down list. To further customize a font set, click Create New Theme Fonts at the bottom of this list to open the Create New Theme Fonts dialog box. Here, you can customize the body and heading fonts and save it with a new descriptive name. Effects: Select a new set of graphics effects by clicking a thumbnail in the Effects drop-down gallery. To save your newly selected color scheme, font, and graphic effects as a custom theme that you can reuse in other workbooks, click the Themes button and then click Save Current Theme. Edit the filename in the File Name text box (without deleting the .thmx filename extension) and then click the Save button. Excel then adds the custom theme to a Custom Themes section in the Themes drop-down gallery, and you can apply it to any active worksheet by clicking its thumbnail.